In just four months, the Office for People With Developmental Disabilities (OPWDD) is scheduled to close the doors at Broome Developmental Center (BDC) as part of its Transformation Agenda. While I support the idea of safely transitioning individuals into residential community settings, I am not convinced that enough capacity will remain in the system for those who will continue to need institutional care. The Transformation Agenda calls for that number to be decreased from the current 400 statewide to 150 in just two settings. Some individuals may have needs that will be too difficult to manage, while others will need closer supervision due to behavioral issues. 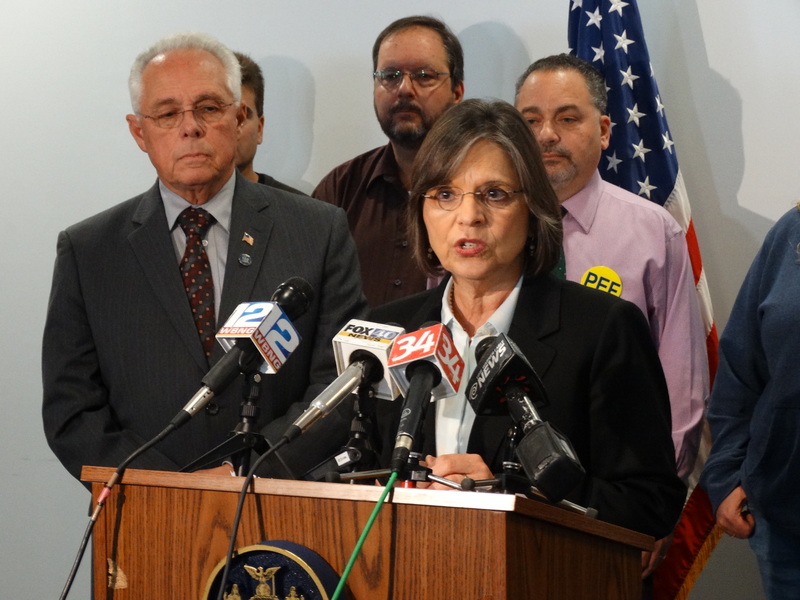 I have asked OPWDD to renegotiate with the Center for Medicare and Medicaid Services that agreed upon number. A bill that I sponsored with Assemblyman Crouch would have required needed services be provided to individuals making the transition. This was filed in response to concerns raised by family members who questioned the quality of care their loved ones were receiving in certain facilities. Unfortunately, the bill was vetoed because the Governor thought my intent was to roll back the effort to integrate people with developmental disabilities into the community. That was not my goal. Assemblywoman Lupardo and Assemblyman Crouch call on the Governor to sign the OPWDD services bill. New York continues to make strides in making energy use more efficient and affordable. As part of New York’s Reforming the Energy Vision (REV) initiative, the Public Service Commission (PSC) held a public hearing in Binghamton on November 17th to gather feedback. Comments ranged from asking the PSC to provide more updates on the plan to updating the state’s aging energy infrastructure. REV is aiming to reduce greenhouse gas emissions to 40%, increase generation of renewable energy to 50%, and decrease by 23% energy consumption in buildings by the year 2030. These ambitious goals will result in lower utility bills, more jobs, and a better environment. To learn more about REV, click here. Winter temperatures are settling in and households in need of assistance paying heating bills this winter can once again take advantage of the federal government’s Home Energy Assistance Program (HEAP). Last year, more than 56,000 homes were assisted in the Southern Tier under HEAP. The program is overseen by the New York State Office of Temporary and Disability Assistance. Eligible households can receive a one-time benefit of up to $625 this winter depending upon income, household size, and heating source.For more information, contact Broome County’s Department of Social Services at 607-778-1100 or click here. Eligible seniors can also contact the Office for Aging at 607-778-2411. Veterans Day is a time to recognize the sacrifice of our service men and women and renew our commitment to getting them the support they deserve. My father served in World War II as a flight mechanic in the Army Air Corps, Pacific Division, so this day is especially significant for me and my family. I was honored to attend Veterans Day events in Binghamton and Endicott and personally thank some of our local veterans for their service. While November 11th is a great time to pause and reflect, we’re committed to supporting veterans throughout the year. I’m proud to have sponsored several bills in the Assembly to combat veteran homelessness and help create job opportunities for returning soldiers. Last year, we passed the Service-Disabled Veteran-Owned Business Act, which allows eligible Veteran business owners to become certified as a New York State Service-Disabled Veteran-Owned Business (SDVOB) in order to increase participation in New York State’s contracting opportunities. Visit the New York State Office of General Services’ website to find out how to become certified. Thousands of businesses statewide have also joined in on the commitment to honoring veterans by offering savings and discounts to active and past military members; to see a list of participating businesses, click here. 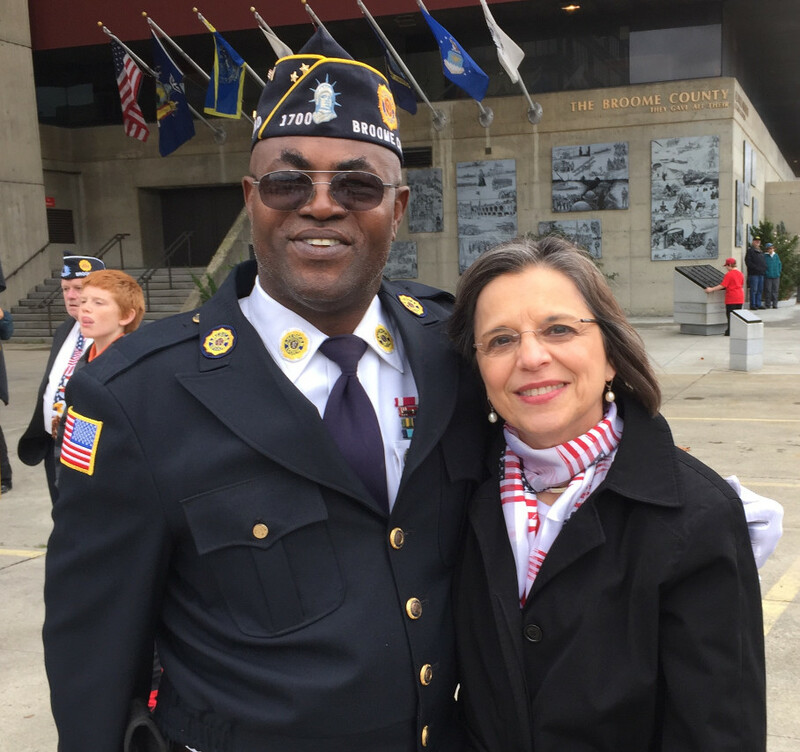 Assemblywoman Lupardo with Gulf War Veteran Charles Duvall. On Friday November 6th, I joined local artist Tom Haines to host a fundraiser to help properly recognize Colonel David Ireland and the 137th NY Volunteer Infantry. Many accounts detail the efforts of Colonel Joshua Chamberlain and the 20th Maine Infantry on July 2, 1863 at Little Round Top in Gettysburg. What many people aren’t aware of is that night at Culp’s Hill, Colonel Ireland and the 137th NY experienced a similar assault from Confederate troops. Under the cover of darkness, the regiment preserved the Union’s hold on Culp’s Hill, greatly contributing to victory in the war’s decisive battle. Even lesser known: before heading off to battle, Colonel Ireland and the 137th NY trained on the south shores of the Susquehanna River in Binghamton. The 137th NY went on to fight courageously in several other battles, and as a result was memorialized with monuments at Gettysburg and throughout the South. However, one key place with no memorial to recognize their heroism is their ‘hometown’ where they trained. Money raised at the First Friday event will pay for the casting and installation of a roadside marker at Veterans Park on Conklin Avenue in Binghamton, just west of the Camp Susquehanna site where the 137th trained. This marker will be dedicated in 2016 and plans are also underway to rename a portion of State Route 434 in honor of the regiment. 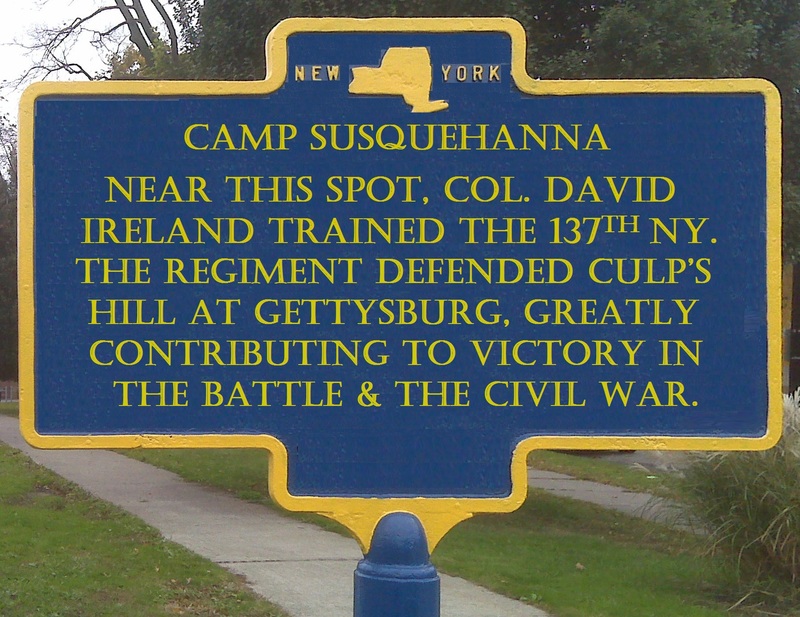 Rendering of roadside marker honoring Col. David Ireland and the 137th NY Volunteer Infantry.